Anyway, I initially made the recipe exactly as written and it was pretty good but it was just a little bit on the bland side. I played around with it a little bit and came up with this modified version. For those Weight Watchers users out there this recipe is 7 points and makes one serving. Serve with ½ cup brown rice. On a more personal note, I have successfully made it through three weeks of Weight Watchers…down 2.5 more pounds at today’s weigh-in. Thank goodness for all those other great bloggers out there dedicated to sharing tasty recipes that are low fat, low calorie, and healthy. I love finding great recipes that fit into my diet and I love sharing the ones I come up with as well! So, if you’ve been enjoying my posts please “Like” my Facebook Page. 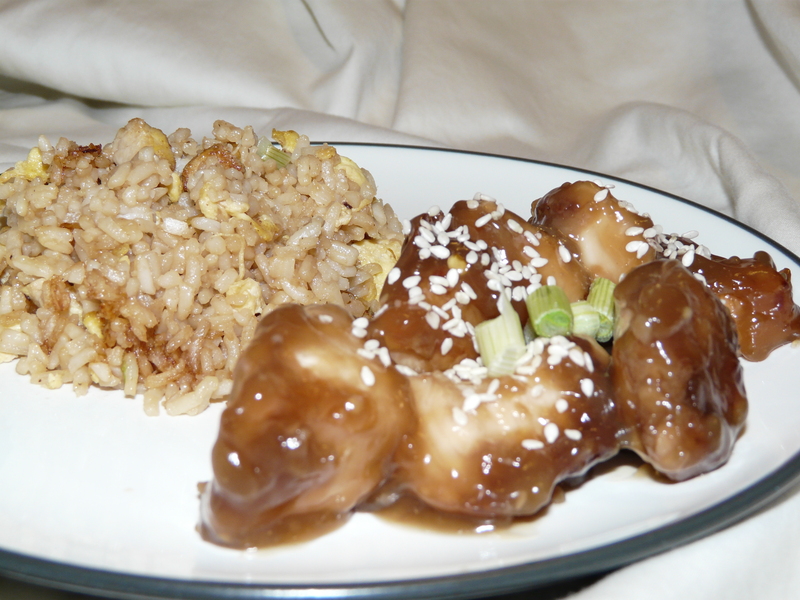 I’m getting hungry….think I’ll make some more of this yummy chicken! In a bowl combine the onion powder, garlic powder, soy sauce, vinegar and egg substitute. Add the chicken and make sure all the pieces are covered. Refrigerate and let marinate for at least 30 minutes. Add the flour in a shallow dish or bowl and dredge the chicken pieces in it, coating all sides. Place chicken on a baking sheet sprayed with non-stick cooking spray and bake in the oven for about 10 minutes or until internal temperature reaches 180 degrees. Meanwhile, make the sauce by combining chicken stock with cornstarch and whisk to dissolve. Heat over medium heat and add syrup, vinegar, ketchup, soy sauce, sesame oil, and garlic. Stirring often, cook until the sauce becomes thick. Add chicken to sauce and toss to coat. Serve and top with sesame seeds and scallions.